There is great power in the moon cycle. The animals are more wild during the full moon and so are people! The NEW MOON is different. It’s 2 weeks after the full moon and is a great time for new goals and manifestations if you know how to use its energy. 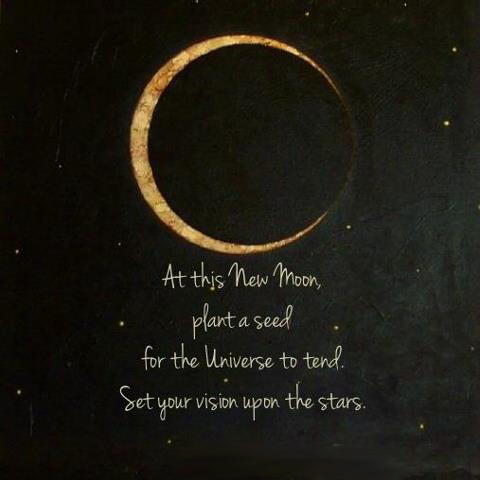 The New Moon is Friday March 20th. This one is powerful because it is a Solar Eclipse and at a crossroads with the Spring Equinox. I got this info from my Astrological Priestess Cindy Morris. Enjoy and happy manifesting! “What does this all mean? It all means that you (yes YOU!) can take this potent energy of RELEASE and REBIRTH and fashion your SELF and your perceived world into whatever you want, however you want it. The good news: it’s entirely up to you. The bad news: it’s entirely up to you. It’s a pretty massive pill to swallow that if your life is anything other than how you would like it is entirely up to YOU to change it. Sometimes it feels impossible to change the outer reality (though it is indeed ALWAYS possible to change reality) but the hard and fast truth is that reality is only and ever a perceptual interpretation through the various filters and blocks you have in your mind. So basically if you want to have a different experience in your life, YOU have to make the internal changes in order for your external reality to change. That’s what HEALING is. HEALING is the release of limitations and blocks to living your full potential. For instance, let’s say you are stuck in a tediously miserable pattern of codependency that looks like you are always taking care of everybody else and no one is taking care of you or, worse, you mold yourself according to what you think everyone else wants of you. The shift in reality open to you at this time (well, always, but even more so at this time) would allow you to turn the focus on you and your needs, making those your number one priority – in other words, loving yourself FIRST before you love and care for any one or anything else. What a concept! This new moon is in the last sign of the zodiac. It is a degree of complete completion. It is indeed possible to release life as you have known it and go for something completely different. Choosing to release old patterns and forms of debilitating behaviors is a conscious choice only you can make for yourself. The very first thing you can do for yourself is to activate and learn to use your own internal navigational system: your INTUITIVE INSTINCT. Once you activate your personal GPS you get to practice reclaiming your life for your own. And who knows what magic you can create in your life when you take over the helm of your life for yourself? Can you even begin to allow yourself to be the boss of your own life, unfettered by stories laid upon you by previous generations, insistences of your present relationships for you to be how they want you to be, and free of all influence except what you receive as personal guidance for you given to directly from your own Higher Self? I have been practicing for a while now and I can report back: come on in! The water is amazing! RECLAIM Your INTUITION and you reclaim YOU. Eclipses are TRIGGER points for growth and change. Where 29 degrees 27 minutes of Pisces falls in your chart is where you will see the completion and rebirth of your intentions and visions for your own life in 3 to 6 months time. The astrology chart is your personalized map of your soul evolution and intention for growth. If you don’t know the map of your journey you waste a lot of time wandering about on the paths that others send you on when you could be spending your precious time living the exact life YOU want! The final of 7 squares between mega planets Uranus and Pluto is full on happening. Use the energy of this powerful aspect to bust yourself out of every limitation you have taken on from others and have placed upon yourself. Laugh, Love, Dream, Believe. You can do, be and have whatever you dream.